On March 16, the Nashville Predators defeated the San Jose Sharks 4-2 to conclude a vital California road trip. The game against the Sharks was the most important of the trip as they are a playoff team and serve as a measuring stick for the Predators. Well, Nashville passed the test after they twice lost a one-goal lead only to regain said lead. It was a statement game for them as they’ve struggled in recent weeks. However, the game was more than a key victory over a quality opponent late in the season. 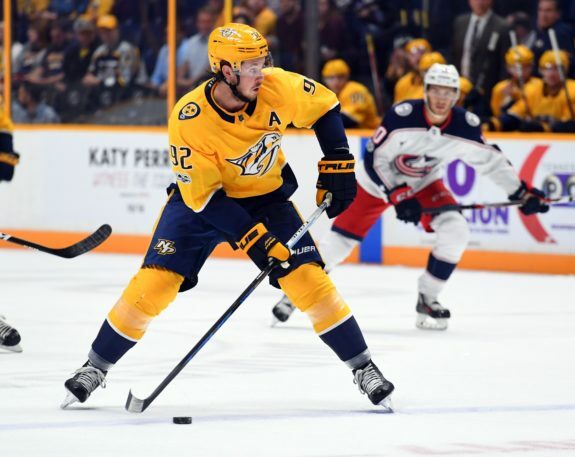 It was full of milestone performances by the Predators’ three most important forwards – Ryan Johansen, Filip Forsberg and Viktor Arvidsson – members of the team’s top line, also known as the JOFA line. With an assist on Forsberg’s goal that gave the Predators a 3-2 lead, Johansen registered his 400th career point in his 583rd career game. It was also his 207th point in his 274th game as a Predator after he scored 193 points in 309 games with the Columbus Blue Jackets. For his career, he has points in 288 of 583 games, including 146 of 309 games with Columbus and 142 of 274 games with Nashville. The Blue Jackets drafted Johansen fourth overall in the 2010 Entry Draft from the WHL’s Portland Winterhawks after he scored 161 points in 134 games. He made the NHL in his first season and posted four straight 60-point seasons between 2013-14 and 2016-17. He has the fifth-most points of anyone in his draft class, one that includes Tyler Seguin and Taylor Hall. The Blue Jackets traded him to the Predators on Jan. 6, 2016 in exchange for defenseman Seth Jones. Since arriving in Nashville, Johansen has centered the team’s top line with Arvidsson and Forsberg. 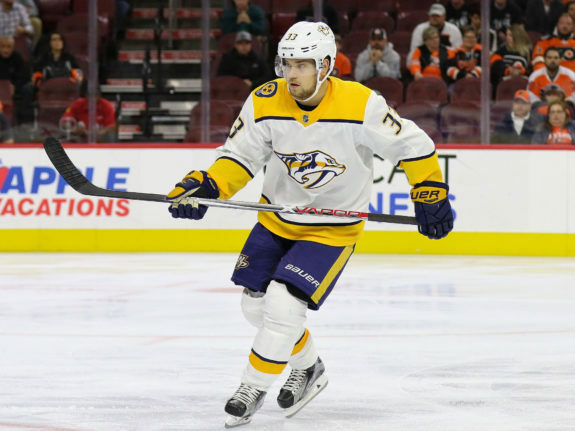 Although he scored 33 goals in 2013-14 and 26 the following season, he has been a playmaker with the Predators, totaling at least 47 assists in two of his three full seasons. Although many didn’t view him as a first-line center, the Predators acquired him to serve that role and he’s performed admirably since. He’s won at least 54 percent of faceoffs each season with the Predators and has been a positive in that category every season since 2011-12, his rookie campaign. He has been at his best in the postseason with 35 points in 41 games with Nashville, including the 2018 Playoffs when he was better than a point-per-game player. Since 2015-16, he has the third-most points on the team behind only Forsberg and Roman Josi. His 47 assists this season already tie for fourth-most in a season in franchise history and he is tied for second in assists per game with 0.66. He is also ninth in career assists in a Predators sweater with 159. Of the players ahead of him on the list, Johansen has played in at least 43 fewer games than anyone else. Not bad for a player who many thought wasn’t a first-line player. The goal that Johansen assisted on to earn his 400th career point was off the stick of Forsberg and gave him his 300th career point. He has achieved this total in 386 games and has at least one point in 209 games. He was drafted 11th overall by the Washington Capitals in the 2012 Entry Draft from Leksands IF in the Swedish Elite League. The Predators acquired him from the Capitals on April 3, 2013 in exchange for Martin Erat and Michael Latta in what has become one of the most lopsided trades in recent memory. He made his NHL debut after the trade and has been one of the most productive Predators since. With his 300th point, he became the sixth player in franchise history to reach the mark. However, he has done so way quicker than any other player (386 games compared to Josi’s 554 games in second place). The goal that gave Forsberg his 300th career point was also his 25th of the season. In doing so, he reached the 25-goal mark for the fifth straight season, and his five seasons are the most in franchise history. In second place are Arvidsson and Jason Arnott with three apiece. He is now tied for fourth in Predators history with 142 goals and is 10th with 158 assists and sixth with 300 points, one point back of Kimmo Timonen for fifth place. He is also tied for first in goals scored in a season with the 33 he netted in 2015-16. 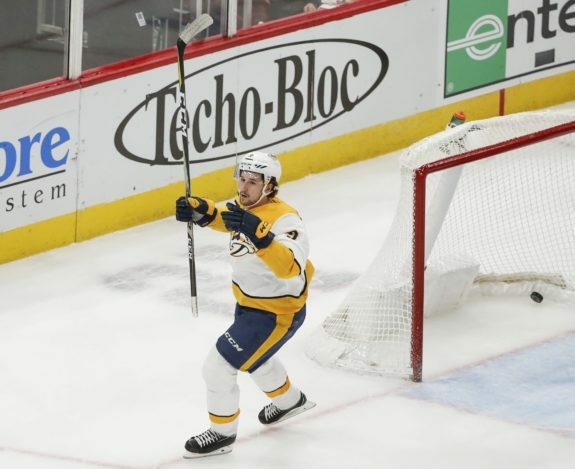 Arvidsson scored two goals against the Sharks – a second-period tally that put the Predators up 2-1 and an empty-netter that secured the victory. His first goal was his 30th of the season, in his 49th game, and he has now scored at least one goal in 23 games this season. When the Predators drafted Arvidsson in the fourth round (112th overall) in the 2014 Draft, there was no way they expected him to develop into a two-time 30-goal scorer, yet that’s who he is. His 31 goals in 2018-19 tie a career high he set in 2016-17 and he has now scored at least 29 goals in three straight seasons, the only player in franchise history to do so. In fact, he’s the only Predator to have three seasons, separate or consecutive, with at least 29 goals, and his two seasons with 30-plus goals tie Forsberg for most in franchise history. His 31 goals this season also compare well with the rest of the league. Of players with at least 30 games played, Arvidsson’s 0.63 goals per game are second only behind Alex Ovechkin’s 0.68. Additionally, Arvidsson’s 29 even-strength goals are tied for fifth in the league and are already a franchise record, as is his goals per game rate, and his 1.97 goals per 60 minutes rate is first in the league among players with at least 500 minutes of ice time. Now only two goals behind the team record for goals scored in a season with nine games remaining, there’s a strong chance Arvidsson sets a new franchise record this season. Not bad for a former fourth-round pick making $4.25 million per season. At this point in the season, when the NHL schedule is in its dog days and the hockey world is waiting for the postseason to arrive, milestones provide a great reprieve from the game-by-game monotony. In this case, it’s a great testament to the three players’ individual abilities to outperform expectations, in the cases of Arvidsson and Johansen, or live up to them in Forsberg’s case. Will it matter in the grand scheme of the season? Not really. 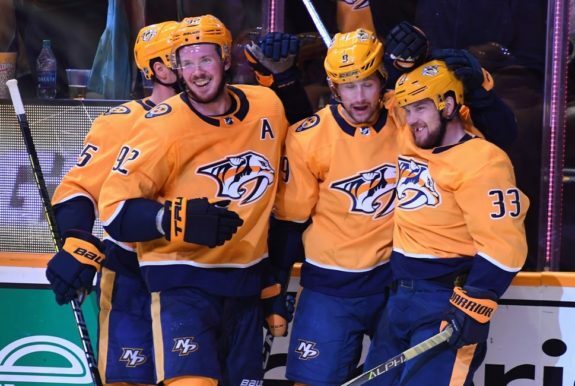 However, with the Predators’ top three forwards performing and firing on all cylinders, it means only good things as the team prepares for what will hopefully be a deep playoff run.